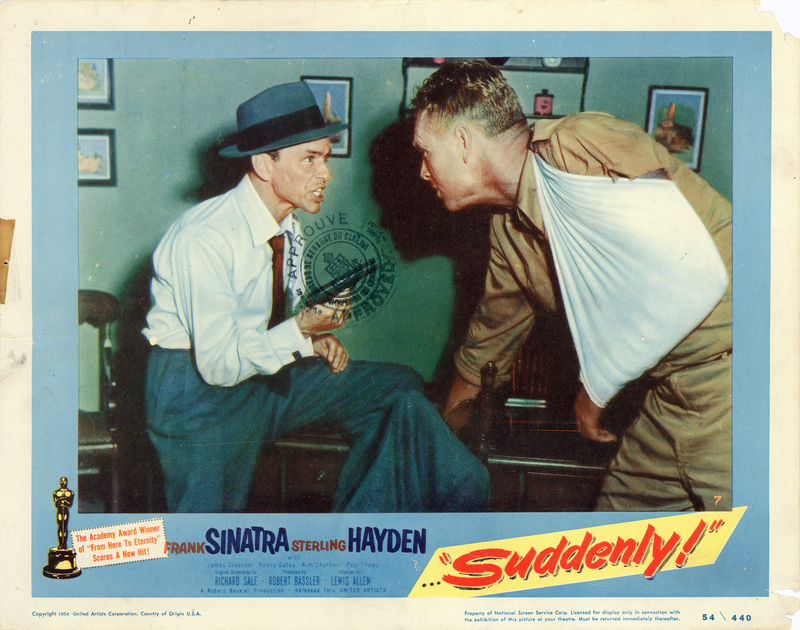 SCVHistory.com LW2870 | Film-Arts | Lobby Card: Frank Sinatra, Sterling Hayden in 'Suddenly' (1954). Frank Sinatra (left) and Sterling Hayden star in "Suddenly" (United Artists 1954). Foreign-used lobby card, 11x14 inches, with bilingual (French-English) censorship board approval stamp. If you can tell what country (or province) approved the film, please let us know. We can't quite read the stamp. LW2870: 19200 dpi jpeg from original lobby card purchased 2017 by Leon Worden.